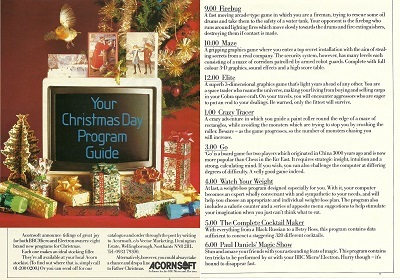 This is a scan of the full-colour two-page advertisement placed by Acornsoft in the October 1984 edition of Acorn User Magazine. It gives a good overview both of the game itself and also the extras included, such as the novella and flight training manual. 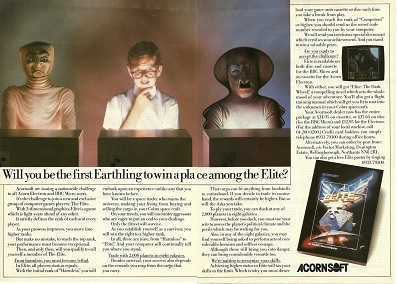 Comparison with other game adverts in the magazine only serves to illustrate how far ahead of the competition Elite and Acornsoft were. 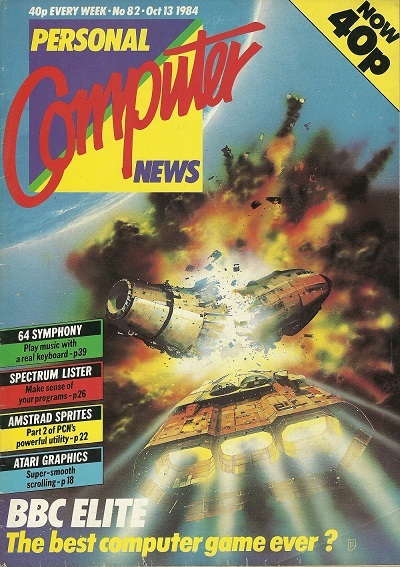 Personal Computer News (PCN) magazine was a multi-format weekly publication which ran from March 1983 to May 1985. The edition for the week ending 13th October 1984 featured a one-page review of BBC Elite.The game earned a 10/10 rating, an accolade it shared that week with Roland In Time for the Amstrad CPC. At the end of a review was a plea to Acornsoft to port the game to the numerous other platforms popular at the time, which duly happened from 1985 onwards, primarily through Firebird. The December 1984 edition of A&B Computing magazine sported a front cover largely dedicated to the receently released Elite on the BBC and Electron computers. 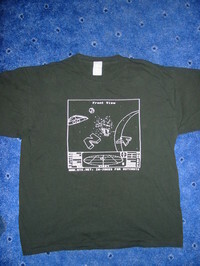 The graphic was the standard Phillip Castle artwork. 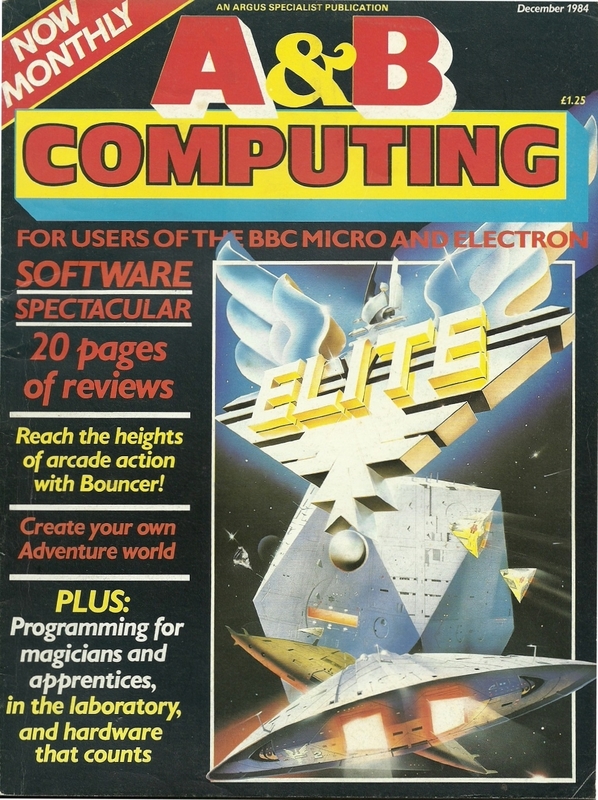 Unlike some of their rivals, A&B Computing afforded Elite no particular favours when the review was printed, being somewhat drab in balck and white only. 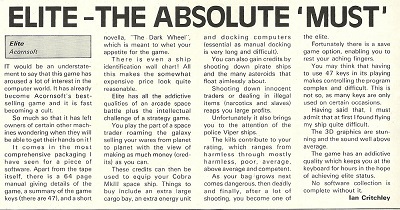 The review contains some factual errors (not all the ships are named after snakes) and some dubious opinions (disc Elite is much better than the cassette version) but is otherwise a well-written and fairly comprehensive review. 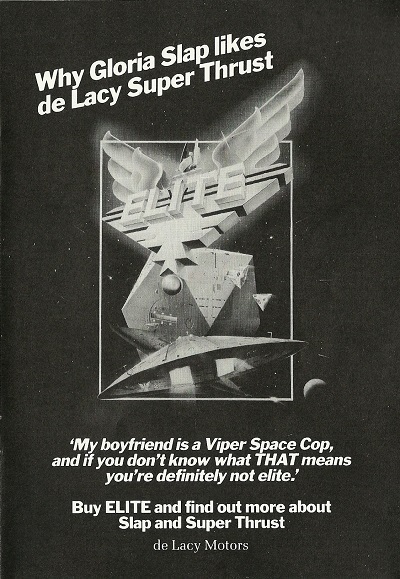 Electron User magazine's review of Elite in their April 1985 edition was even more minimalist. No pictures were included, perhaps in an attempt to ignore the lack of colour graphics in the Electron version. 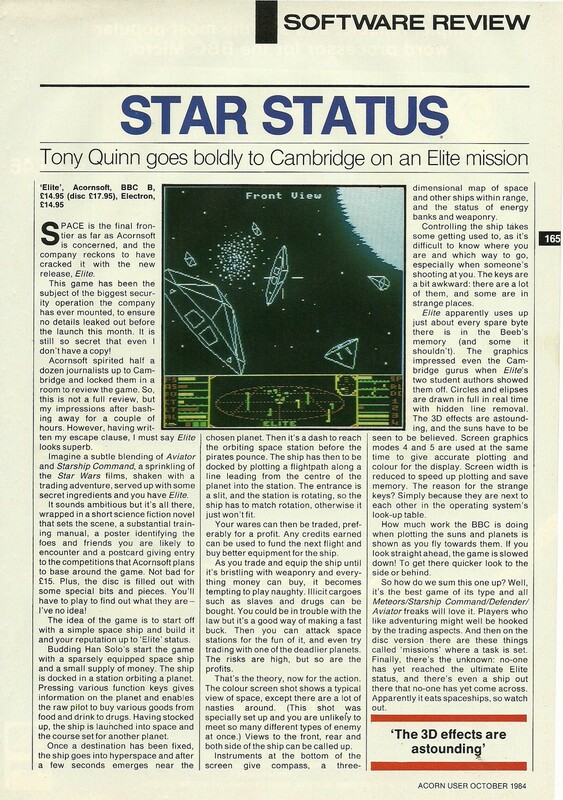 The review itself is very positive about the game, however. Elsewhere in the magazine a reader claimed the black-and-white graphics were easier to read, in any case, and the bug which rendered the Galactic Hyperdrive inoperable in early releases was fine because there were more than enough systems to visit in Galaxy 1! Also in the December 1984 edition of A&B Computing magazine was a two-page full colour advertisement placed by Acornsoft, revealing their suite of games and programs at that time which could keep a BBC micro owner busy on Christmas Day. 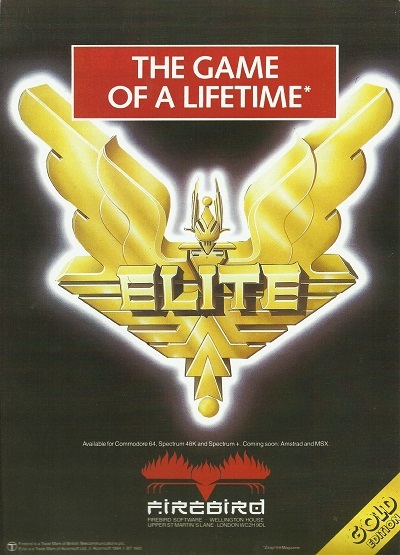 It is not explained anywhere why they feel someone would play Crazy Tracer for twice as long as Elite! 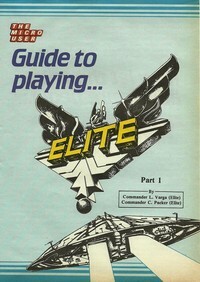 16 months after Elite was released for the BBC and Acorn Electron computers, and possibly to coincide with the arrival of enhanced BBC Master versions of Elite, The Micro User magazine produced a two-part guide to playing Elite in the January & February 1986 editions. 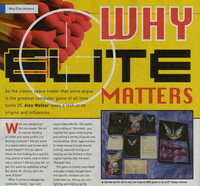 The January publication also featured some Elite-based artwork on the front cover, as shown here. 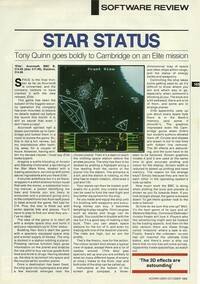 Click on the image for Part 1 to open the full contents. 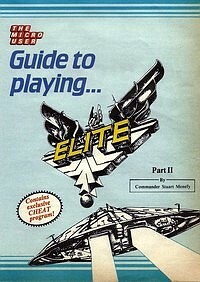 Part 2 is merely a cheat program and of little practical use. 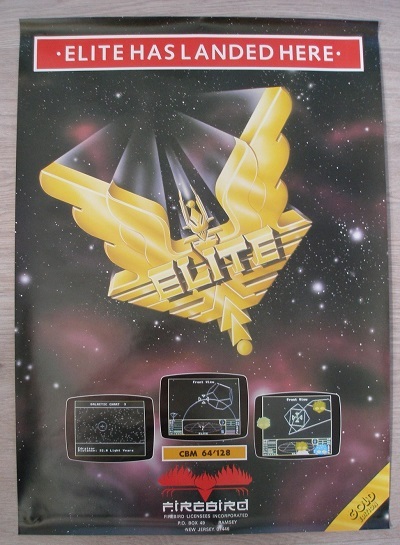 At the gathering to celebrate 25 years of Elite, origami sheets for Elite ships were handed out. 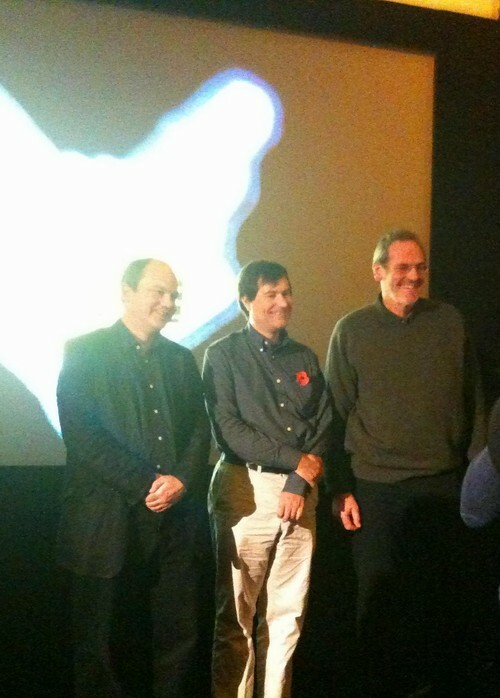 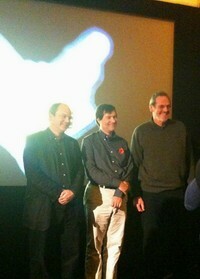 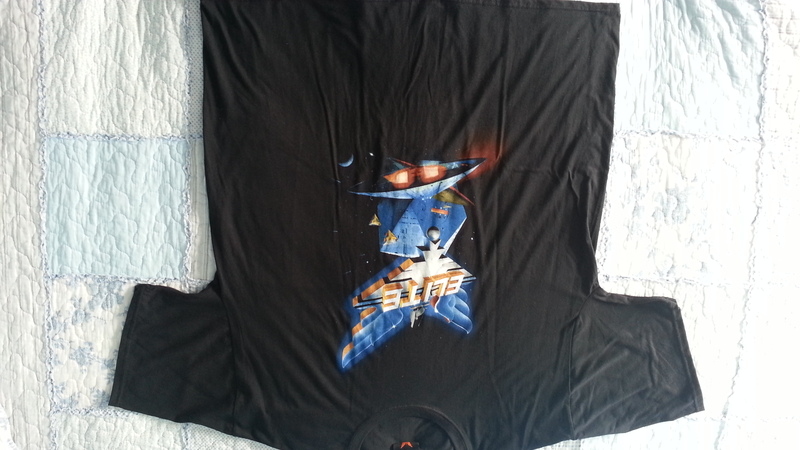 I managed to get mine signed by David Braben, Ian Bell, Mark Bolitho (origami expert) and Rob Holdstock. 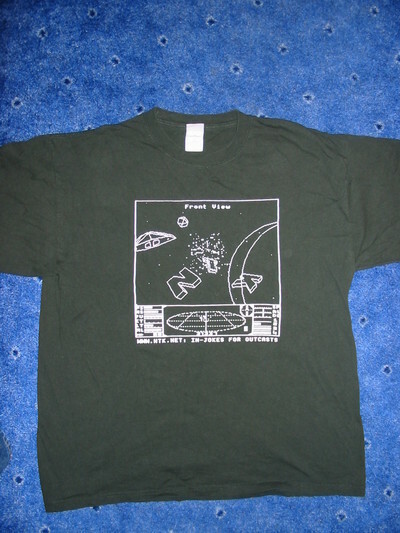 Click to the top image to the left to see this. 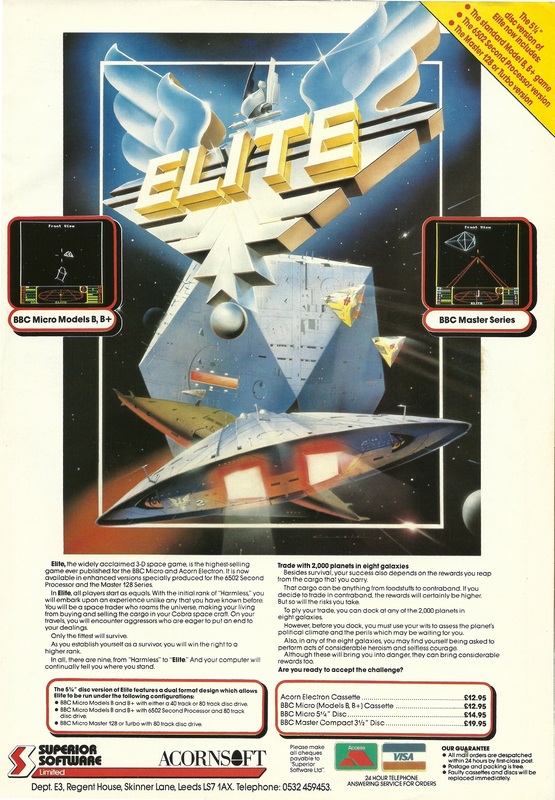 The bottom image shows a short account by Mark of how Elite origami almost made it into the game packages for the non-Acornsoft releases. 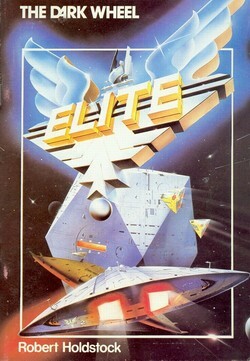 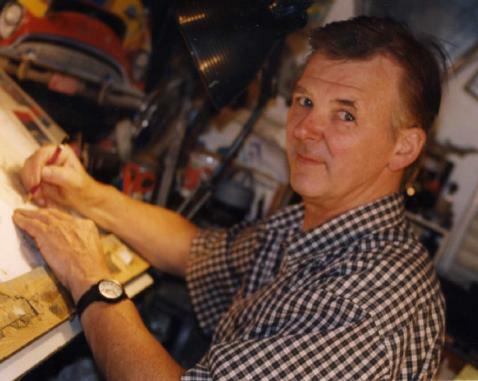 For the Acorn versions of Elite, renowned airbrush artist Philip Castle was commissioned to produce the cover artwork. 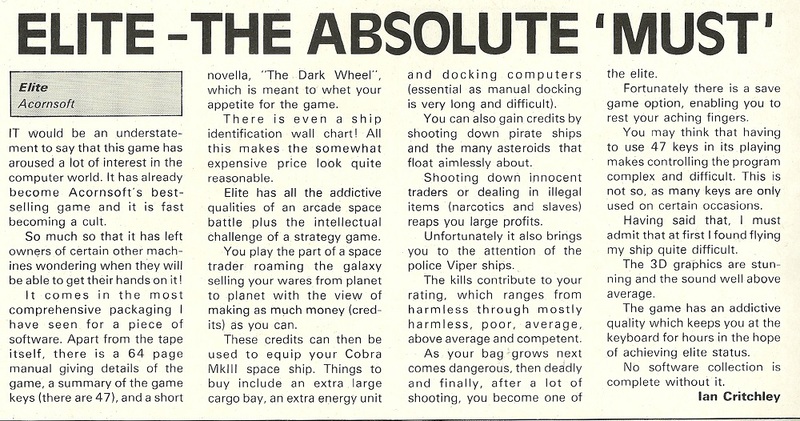 It appeared both on the outer box and on the cover of the novella "The Dark Wheel". 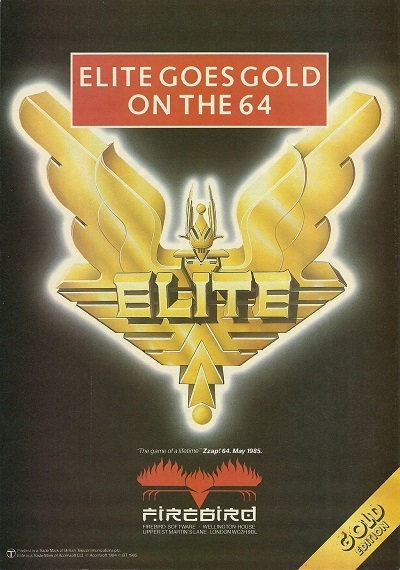 It has become an iconic image in the history of computer gaming. 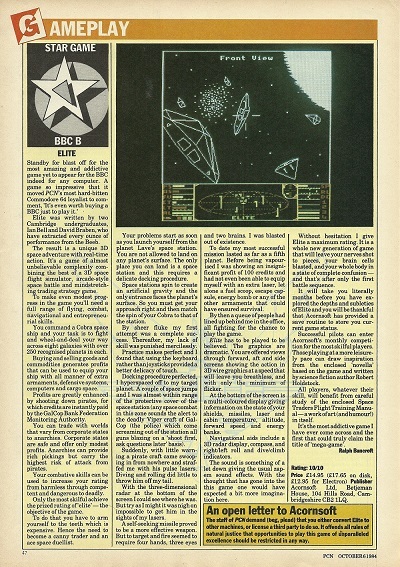 1984 was an amazing year for the BBC micro as not only was Elite released, but the best 8-bit racing simulation also came out - Revs. As with Elite, Acornsoft packaged Revs with printed booklets, in this case a Formula 3 Driver's Handbook and a Special Revs Racing Programme. 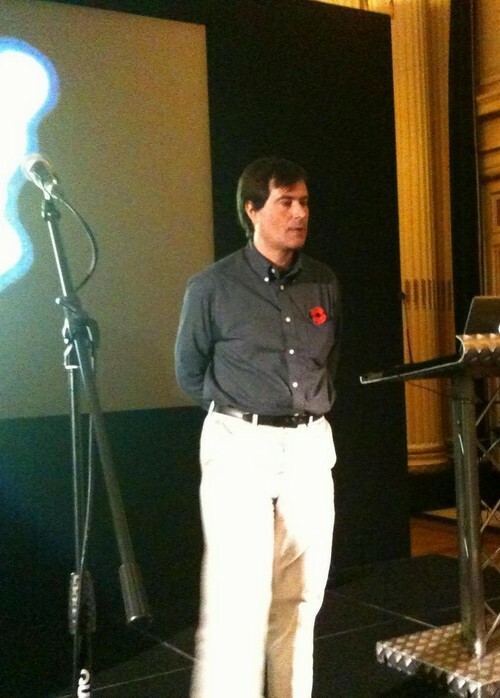 The latter discussed the layout of the Silverstone racing circuit, its history and featured adverts for other Acornsoft products, namely Aviator and Elite. The picture here is a scan of the Elite advert, which was printed in black and white. 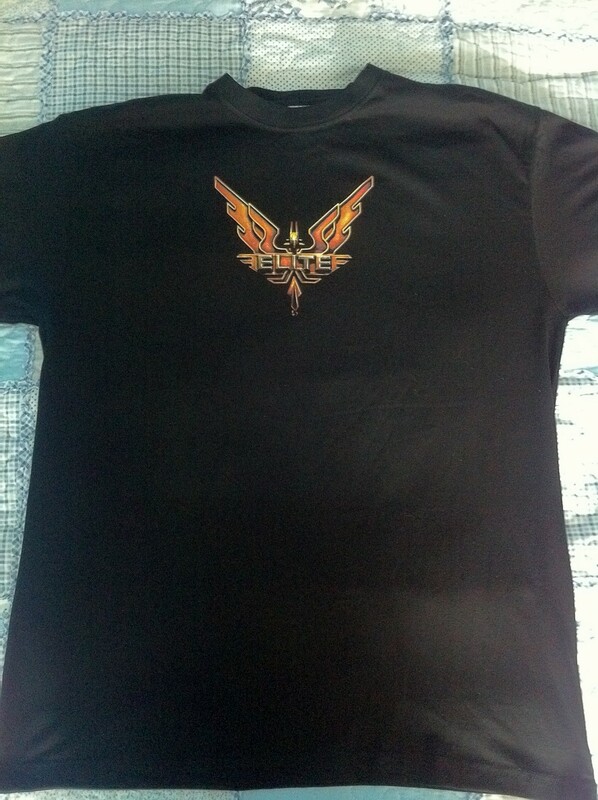 Gloria Slap is one of the AI racers in Revs. 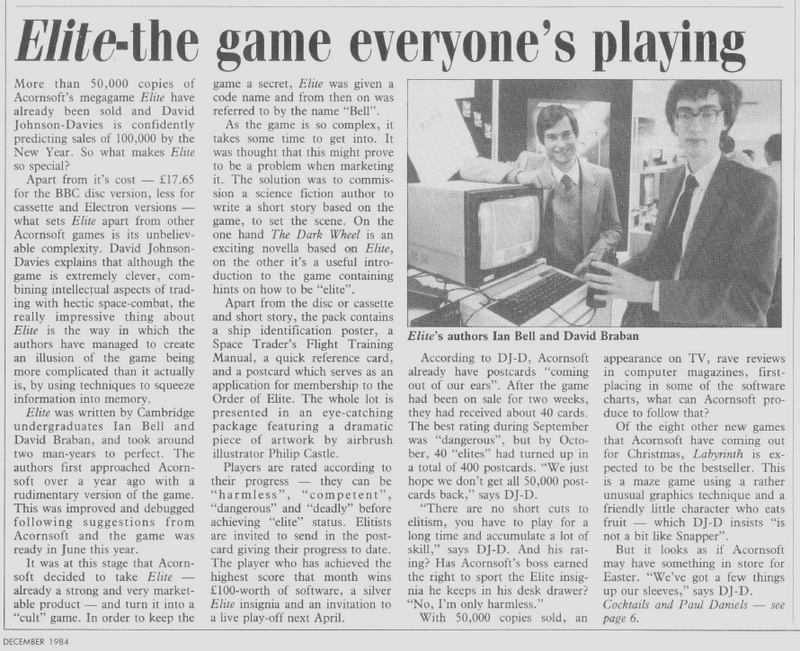 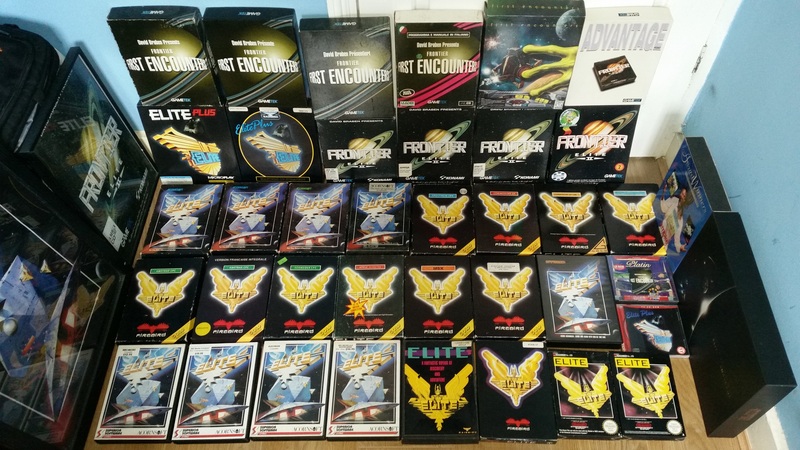 After Leeds-based Superior Software bought the rights to Acornsoft's range of games, they re-released the game in new packaging and catered for the new range of BBC machines. 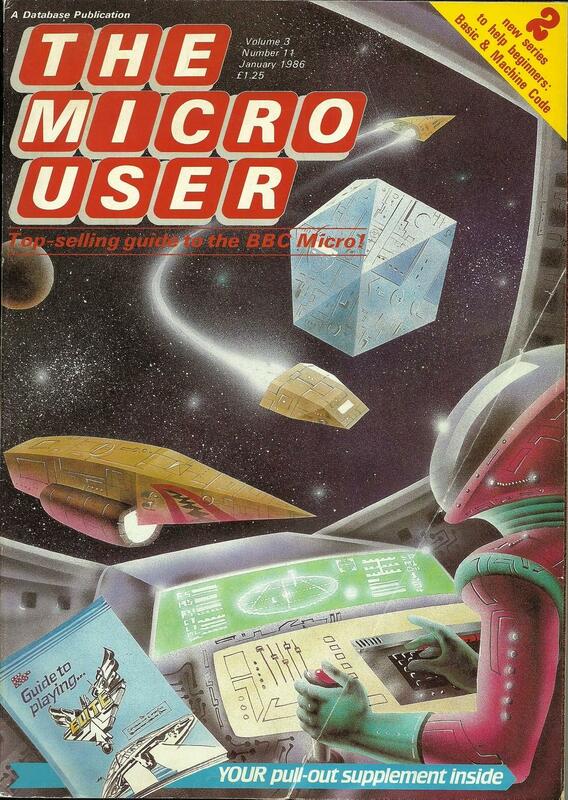 This advert, in the February 1987 edition of Electron User Magazine, features the original cassette releases for the BBC and Electron, plus a new version of the 5¼ inch edition, which catered for BBCs with Second Processors plus the BBC Master. For an extra £5.00 the 3½ inch Master Compact version could be bought. 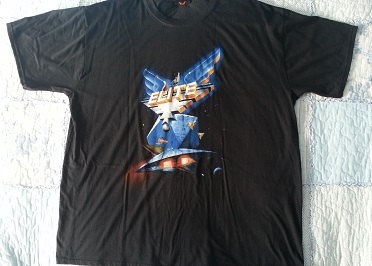 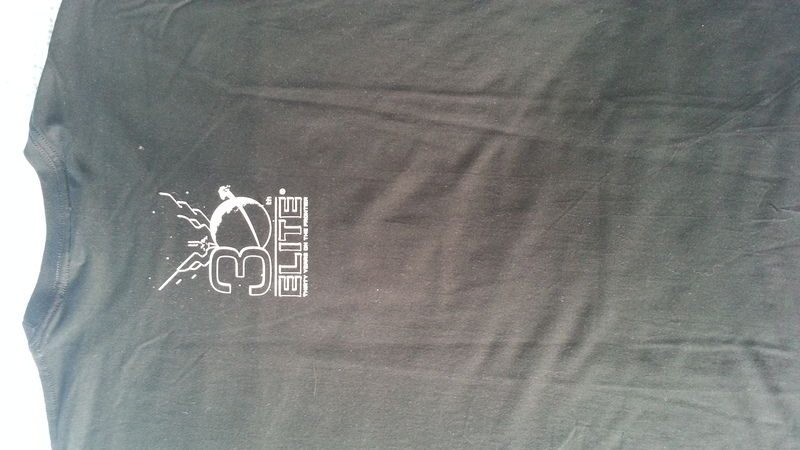 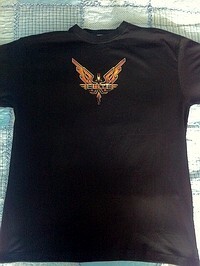 Below left is an Elite-style t-shirt from the now-defunct ntk website. 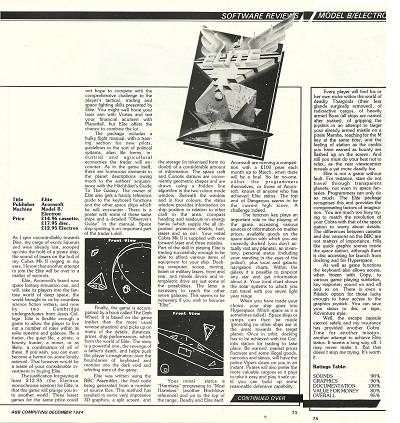 The wording along the bottom reads "WWW.NTK.NET : IN-JOKES FOR OUTCASTS"
Tracker was a game published by Rainbird for a variety of formats in the mid to late 1980s. It was a strategy/action game where you piloted your Skimmer craft through a series of mazes with the ultimate goal of destroying the Centrepoint computer entity. 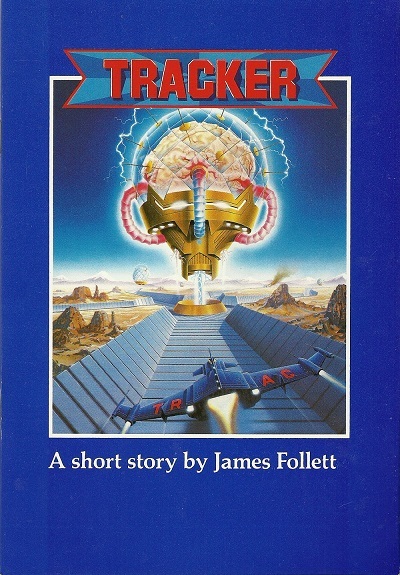 The reason the game is mentioned here is the novella which accompanies the game, also called Tracker and written by British author James Follett. The novella seems to pay homage to Elite by a number of references, including an orbital station above the planet Lave and a trader encountered there who pilots a Cobra spacecraft.